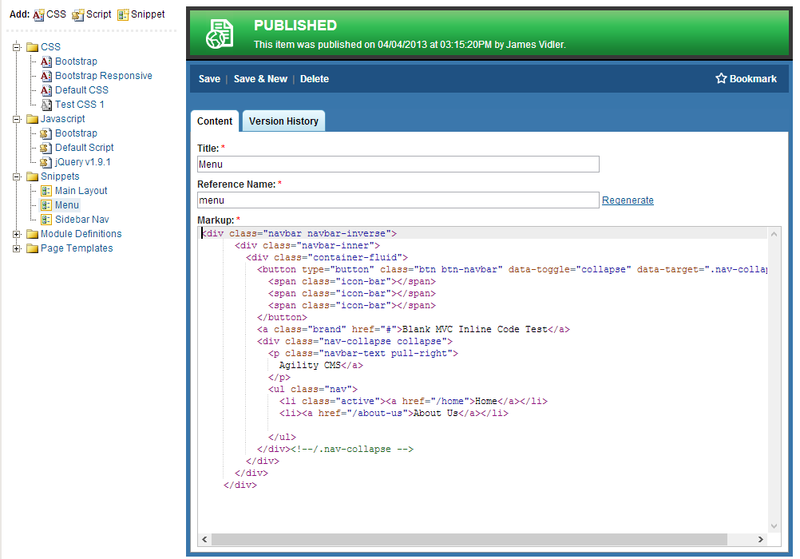 The Agility April 2013 Release introduces two new features Inline Code and Extensionless URLs. The Extensionless URLs feature can now be enabled to allow Agility to process URLs without the ".aspx" extension. In order to use Inline Code, you MUST update your website's Agility.Web.dll. You can download the latest version here. For websites hosted in Azure, Inline Code will be automatically activated. For all other sites, please contact support@agilitycms.com for activation. You selection should follow your current website code type. Inline Code can be accessed by either navigating to Settings > Inline Code, or directly from the Module or Page Template which uses Inline Code as the Output Type. CSS: create, modify, or delete CSS inline and optionally enable minification. Snippets: create, modify, or delete HTML snippets inline, these snippets may also contain Razor or WebForms code. Module Definitions: modify Module Output code using HTML and Razor/WebForms code. Page Templates: modify Page Templates. When editing an Inline Code item, and then switching to another item, it will automatically save the original item before loading the new one. Agility will automatically generate Markup for your Page Templates and Module Definitions based on your Page Template Module Zones and your Module Properties. This provides a good starting point and bypasses the ?blank canvas?. You can also optionally revert back to auto-generated code by clicking the Regenerate Code button in the Action bar of the Page Template or Module Definition within Inline Code. For more detailed information and step-by-step instructions on how to use the new Inline Code feature, please review the Inline Code Documentation on the Agility Developer website. Extensionless URLs can now be enabled to allow Agility to process extensionless URLs. For WebForms sites, this means the common .ASPX extension will no longer be necessary. Most MVC websites have already had this advantage. Caution: Changing your site to handle Extensionless URLs will not automatically change any existing links to *.aspx URLs. These will still continue to be processed by Agility. For example http://website.com/home and http://website.com/home.aspx will be processed and return the same page. This could also potentially be an SEO issue as both URLs can be different and still return the same content. In order to enable extenstionless URLs, you must download the latest Agility.Web.dll which can be found here. Your site must also be running in IIS Integrated Mode in addition to checking the box labelled Extenstionless URLs which can be found in Settings > Global Configuration.